OXO Good Grips kitchen products are well designed items for people to use in the kitchen. 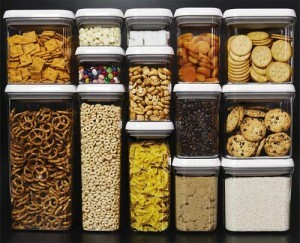 The OXO Good Grips POP Containers is another excellent example. Even better they really do make life easier for people who have physical disabilities. Is it a struggle to get the lid onto so many airtight plastic boxes? Then it can be difficult to get the lid off as well. Take a look at the typical plastic box. It isn’t square, there is quite a large rim round the edge to provide an airtight seal and this takes up space when you store them side by side. Think how much space is wasted when they are in the fridge or cupboard. The big advantage with these boxes is the unique pop-up mechanism. Push the button down to create a seal or break the seal. This creates an airtight seal with one touch. 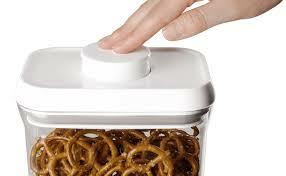 The button serves as a handle so it is easy to remove the lid with one hand. Take the average plastic box and try to open or close it using only one hand or imagine doing it if you have poor coordination. The same problem would exist if your hands or wriste were weak because of arthritis. The boxes come in a variety of sizes from as little as little as o.3 litre upto over 5 litres. This is a simple, yet effective, solution to keeping your food fresh and your kitchen organized. No good quality plastic box is going to be cheap. Storing a quantity of empty POP containers in a cupboard waiting to be used will be quite space consuming. Do not put the lid into a diswasher for cleaning and it is not recomended for use in a microwave. Go onto the Amazon website (Click here) and you can choses from the full range of 12 different OXO Good Grips POP Containers. Press on the ‘pop’ mechanism and it comes up and releases the seal meaning the lid can easily be lifted off.